Planet Fitness, a Welsh based privately owned gym received £500,000 finance package from HSBC to expand and develop their current Bargoed gym and to open their new site at Tredegar. A locally based company to our main office and manufacturing facility in Caerphilly, South Wales, we were the perfect choice to provide made to order locker and changing room equipment for both gym locations. The objective was simply to design and build lockers and changing room equipment to match the vibrant colour scheme of the welsh gym brand, and a product that could withstand constant use and moisture resistance due to the adjacent shower facilities. 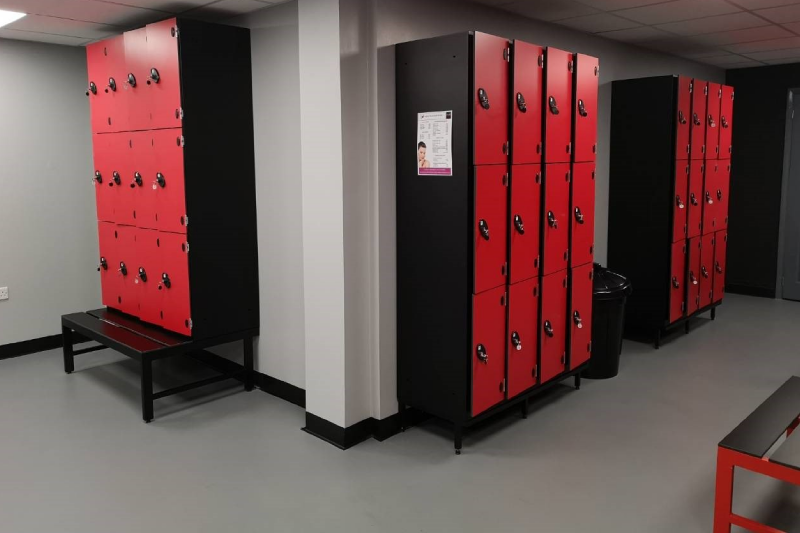 We designed and manufactured a selection of 3-tier aluminium lockers, with vibrant red, plant-on, solid grade laminate (SGL) doors from our Supreme locker range and fitted then with our wet area coin return locks, matching number discs and key fobs. 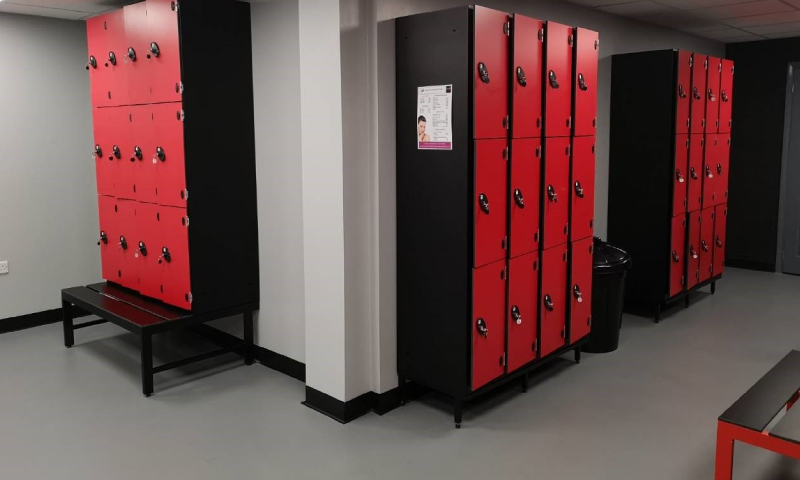 These lockers are designed specifically for wet area use were the perfect choice for this project due to their moisture resistant materials, antimicrobial powder coating and heavy-duty SGL doors. The lockers were raised off the ground by including both locker stands and stand seating, given better access for cleaning beneath the lockers and to provide additional seating area for gym users. Both the locker stands and stand seating were built using the same moisture resistant aluminium as the lockers and the latter fitted with SGL slats for seating. Finally, to complete the room, double sided cloakroom units were added, matching the room and brand colour scheme. Each unit was fitted with SGL seating slats, backrest and an SGL hook board with satin anodised aluminium hooks.